At the conclusion of a very scorching late summer day in the Bay Area, the Mission on Mission led me to the next stop along my journey. 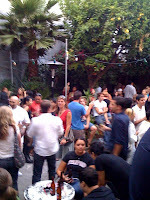 El Rio, a bar that defines itself as “your dive”, is the perfect oasis on the rare summer day in SF. El Rio’s entrance is deceptively unassuming—but as I walked through the bar’s plain gray doors I was accosted by the bar’s dynamic vitality. Packed but not stuffed, the bar hosted a lively crowd who were busily wetting their whistles and chatting with their friends as music blared in the background. Hosting a clientele from all walks of life this surprisingly large bar on Mission Street puts “happy” back in “happy hour”. The just-off-work crowd captured the diversity of San Francisco’s 20- to 40-something professionals with representatives from the financial district, local construction sites, Mission coffeehouses and even the drag scene. 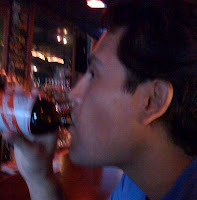 El Rio’s Happy Hour runs from 5 – 9pm but on this hot evening draught beers were out of commission so my suds of choice were Red Stripes, an option I often overlook. El Rio lives up to its claim of being “your dive” with the usual telltale signs of a dive bar: pool table, shuffleboard table near the entrance, juke box (a dive bar necessity), Giants’ game on the tube, DJ booth, dice behind the bar and, of course, what every dive bar needs … regulars. 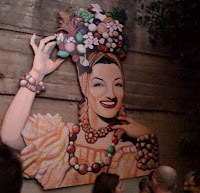 The rare hot weather was reason enough for any regular to make their way to El Rio for a cold beer—it also provided Bernal and Lower Mission inhabitants the opportunity to swagger out for the evening in their “summer attire”—which on this particular night meant plenty of pasty skin and tattoos. As I ventured to the back of the bar, I ended up on the backyard deck overlooking a sizeable patio. In the far corner a grill was available for those who were keen enough to bring some steaks or dogs with them. Though I don’t eat meat, I am sure the steaks go nicely with the oyster appetizers which are occasionally free and served on Friday nights starting at 5:30pm. I hear those go quick so make sure you’re there early. There’s a lot going on at this neighborhood bar and the backyard deck and patio is a great space for hanging out, catching up with old friends and making new ones. Hanging out on the patio my senses were bombarded with music, lively conversation, cigarette smoke and an even wider array of colorful outfits, skin and some really incredible well-done tattoos. I even caught a glimpse of a woman in fishnet stockings wearing nothing else but a red button-up shirt that barely covered her derriere. And, actually, she didn’t even stand out as much in the sea of other interesting outfits—some slinkier than others. That was before I noticed the flyer for the Red Hots Burlesque show that was sitting the deck’s railing … SF’s most socially conscious burlesque show appears at El Rio every Friday night from 7:30-9pm. The stage was located off the patio in a separate a room that also has a DJ booth and seating—the perfect spot for a live band or, in this case, a striptease. With a $5 - $10 donation, the cover charge was reasonable especially considering that some of the money goes to charity. Kingfish, the comedian/host of this event, brought the standing-room-only crowd to attention by grabbing the mic and telling a few hack jokes. The gathering, which looked to be more women than men, waited with anticipation as the first performer was introduced. The burlesque starlets sang, danced and performed their routines to the enthusiastic and rowdy audience. Tattooed and au naturale, the performers brought down the house with their modern and cheeky interpretations of this vaudevillian tradition with reviews ranging from a risqué striptease to a comedic interpretation of fan dancing. At the midpoint of the performance the audience was given the opportunity to purchase $1 raffle tickets for a drawing where the raffle winner would get to select a charity for the collected raffle funds. My tickets were losers but it was nice knowing the money was going to a good cause. As the performance came to a close, so too did my evening. The burlesque show was definitely a highlight of the evening. After having had my fill of beers I meandered through the still-busy bar and stepped out into the mild, fog-free SF night. Makes me want to go there. ....and there is NOTHING wrong with the white, pasty people of the world, thank you! What is Mission on Mission? Mission on Mission is my journey down Mission Street in which I visit each bar beginning at Crescent Avenue ending at the Embarcadero. Each Friday night at 6pm I will arrive at a new destination along my journey. 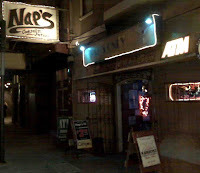 Mission on Mission is dictated by strict parameters: I will visit all bars on Mission Street in order until I reach the Embarcadero; I arrive at each bar at 6pm, show up alone and will post to this blog by Monday morning. Favorite Beer is Sierra Nevada. Food is Pizza. Not a big dancer but will cut a rug after a few (and it is ugly!). I enjoy hitting up all sorts of bars both nice and divey. Work in an office setting and it may be a while before I meet someone on my Mission who also works in an office. Born and raised on the Peninsula in the San Francisco Bay Area.